Let's assume that, with the benefit of hindsight, we could specify the ideal gun armament for a Second World War fighter plane. What might it look like? If the fighter was to have all-round capability, i.e. effective against enemy bombers as well as fighters, then the first conclusion is that explosive/incendiary projectiles were essential. 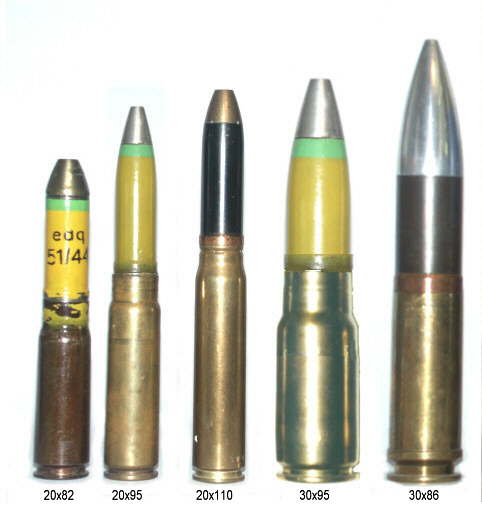 Comparisons between the destructive power of different types of rounds clearly reveal that the blast effect of HE, combined with the kinetic energy of the shell fragments being hurled through the target and the incendiary effect of the chemicals, add up to considerably greater effectiveness in most circumstances than can be achieved by the kinetic energy of solid bullets or AP projectiles. This places a certain lower limit on the calibre of the gun. HEI projectiles were available in HMG (heavy machine gun: 12.7-15mm) and even RCMG (rifle calibre: 7.5-8mm) but these little bullets could contain only small quantities of chemicals. It was generally concluded that the smallest shell-firing calibre really worth bothering with was the 20mm cannon. This was demonstrated by the Luftwaffe, which much preferred the 20mm version of the MG 151 to the 15mm, despite the higher velocity (and therefore hit probability and armour penetration) of the smaller calibre, and the fact the HE and incendiary versions of the 15mm were available. The Soviet Air Force similarly showed an increasing preference for the 20mm ShVAK over the lighter and faster-firing 12.7mm Berezin. Powerful HMGs like the Berezin and the .50" Browning were of course far from useless. They remained quite effective against fighters but would probably have found great difficulty in shooting down heavy bombers. The USN tested the 20mm Hispano against the .50", and concluded that the Hispano was three times as effective at normal fighting ranges, even though the gun weighed less than twice as much. So, the calibre for our standard fighter gun should be 20mm. Even this might not be enough in some circumstances. If it proved necessary to deal with really tough bombers, then the experience of the German and Japanese air forces showed that it was useful to have larger-calibre cannon - ideally 30mm - available as well. What kind of ammunition characteristics would perform best in these 20mm and 30mm weapons? Most cannon shells were made by drilling a hole through a solid steel projectile, to make room for the chemical contents. This led to heavy, thick-walled shells which only contained around 8-10% HEI by weight. In a typical 20mm shell weighing 120g, this meant that only around 10g was HEI mixture. The Germans developed a new type of shell made by drawing from a disk of steel, just as cartridge cases are made. These projectiles were thin-walled and much lighter overall, yet had far more room for chemicals. Their large capacity led to them being called "mine shells", or Minengeschoss (M-Geschoss for short). The standard 20mm M-Geschoss weighed only 92g yet held 18-20g of HEI chemicals, doubling the blast/incendiary effect. It was not always better than the traditional heavy shell (it depended on where it hit) but was usually more effective. An additional benefit was that the light weight permitted a higher muzzle velocity, reducing the time of flight. The light weight also meant that the M-Geschoss slowed down more quickly and had a shorter effective range. This problem was exacerbated by the blunt-nosed profile of the shells, causing high aerodynamic drag. A later version of the 30mm M-Geschoss, the Ausf. C pattern, had a more tapered form with an aerodynamic, bullet-like profile. This was less efficient in weight/HE content ratio, but the shorter flight time and gain in effective range were considered worthwhile. Our ideal projectiles should therefore be the more streamlined type of mine shells. Although this would be the most effective type of ammunition, a steel-cored API could also be offered, with a matching weight, shape and trajectory. Tracers would not be used, as in a fighter these had more disadvantages (in warning the enemy he was under attack) than advantages. The optimum belt loading would probably be two or three HEI for each API, although more equal proportions would be better for ground attack or anti-shipping strikes. The 92g M-Geschoss proved very effective. To carry the same 20g HEI as this, our ideal streamlined mine shell would probably weigh around 105g. The extra weight would help to extend the effective range as well as providing better penetration into the target. The muzzle velocity would need to be reasonably high in the interests of short flight time (important for scoring hits, especially in deflection shooting) and maximising the effective range. On the other hand, it shouldn't be very high as that would require a bigger cartridge case, a bigger and heavier gun and probably a slower rate of fire. Comparison with other cannon suggest that around 850 m/s would be optimal. A 105g shell at this velocity generates 38,000 joules muzzle energy; by comparison, the 20x110 Hispano generated 47-50,000 joules, the 20x82 MG 151 29,000. If the case diameter was the same as these rounds, at 25mm, then the length would need to be between them, say 95mm. This is virtually identical to the Japanese Ho-5 20x94 round, but the Japanese projectiles were quite short so the overall length of our ideal 20mm cartridge would be greater. The 20x94 only generated 29,000 joules, but it was severely downloaded because of the weak gun action caused by the use of low-grade steels. As a matter of interest, the muzzle energy of our "ideal" round would be almost the same as the Japanese Type 99-2 (20x101RB: 128g at 750 m/s) but this cartridge case was more slender. Comparing this performance with the calculation of cartridge effectiveness in this ARTICLE shows that it would have a damage effect of 259 for the HE shell, giving a power factor of 26. This compares with 20 for the 20x110 Hispano round. Problems were experienced when guns with different ballistics were combined on the same fighter, as the varying trajectories and flight times made it very difficult to score hits simultaneously with the all of the guns. A prime requirement of our 30mm gun would therefore be that the ballistics should be an exact match for the 20mm, to allow both calibres of gun to be used in the same plane. The key to this is the projectile, which must have the same ballistic coefficient. Assuming the aerodynamic profiles are identical, this depends on the sectional density ratio, and the exact match for the 20mm/105g is 30mm/236g. If this was of the same streamlined Ausf.C type, it would probably contain around 50g HE (this compares with 330g/75g HE for the Ausf.C). 236g is lighter than most 30mm shells have been, but not by much. The muzzle velocity would of course have to be the same as the 20mm, at 850 m/s, generating a muzzle energy of 85,000 joules. This is coincidentally the same as the postwar 30x113B Aden/DEFA round, although that has a slightly heavier projectile at a slightly lower muzzle velocity. By comparison, the WW2-era 30mm were: MK 108 (30x90 RB) 42,000j; MK 103 (30x184B) 140,000j; IJN Type 2 (30x92RB) 66,000j; IJN Type 5 (30x122) 87,000j; and IJA Ho-155 (30x114) 58,000j. As our 30mm gun would have to do about 2.25x the work of the 20mm (the difference in projectile weight) it is reasonable to assume that the case capacity would need to be around 2.25x greater to hold the necessary quantity of propellant. A certain amount of fiddling with lengths and diameters results in a case diameter of 37.5mm for the same 95mm case length as the 20mm round. This is a very rough and ready measure, but looks about right; it is shorter but fatter than the 30x113B, so would have about the same capacity. As it happens, the Ho-155 case (30x114) has exactly this diameter; but again had to be seriously downloaded for the same reason as the Ho-5. The 30x91 case for the experimental Mauser MK 212 (a rival for the MK 108) also had the same diameter, being just a few millimetres shorter, but the shell was seated deeply in the case, reducing the powder capacity and therefore the muzzle energy. The same calculation of cartridge power gives a factor of 62, compared with 58 for the MK 108 and 99 for the MK 103. A picture showing what these ideal shells might look like is HERE. The cartridges, from left to right, are the 20x82 MG 151/20 (with the blunt-nosed M-Geschoss), our "ideal" 20x95, the 20x110 Hispano, our "ideal" 30x95, and the postwar 30x86B Aden LV, which was almost identical to the cartridge for the Mauser MK 213 revolver cannon being tested at the end of WW2. As a matter of interest, the 20x95 image is simply the Ho-5 case, loaded with a scaled-down Ausf.C M-Geschoss. The 30x95 image was created by shortening the Ho-155 case and matching it with a shortened Ausf.C. The main restriction is that we can only choose technology which was in use at the time - no revolvers or rotaries! There was still a considerable choice in gun mechanisms, but of course we would only be interested in the most successful, by which I mean the ones which could deliver a high rate of fire with reasonable weight. The guns would of course be belt-fed. They should also have electrical ignition to facilitate synchronisation. In 20mm weapons, the best performers were the Soviet gas-operated ShVAK (800 rpm, 42 kg) and Berezin (800 rpm, 25 kg), the recoil-operated Japanese Ho-5 (850 rpm, 35-37 kg) and the hybrid (gas-unlocked delayed blowback) Hispano Mk V and US M3 (750 rpm, 42 kg). The recoil-operated MG 151 could also manage 700-750 rpm from 42 kg, but the Hispano could be speeded up significantly; Molins demonstrated a version firing at 1,000 rpm, but it was not produced because too many parts were different. The Ho-5 was basically a copy of the Browning M2, which also demonstrated its ability to be speeded up, to 1,200 rpm in the M3 version. So our best choice of action seems to lie between the Hispano and the Browning. The Hispano was a slim gun, well suited to engine mounting. As used in WW2, it fired from a rear sear (open bolt) and could not be synchronised, but electric priming would resolve this problem. The Browning receiver was relatively bulky by comparison, a problem in larger calibres. The Browning was significantly more reliable, but it appears that it relied on some high-stress components in the mechanism (which is why the Japanese had to reduce the power of the larger versions) and it may be significant that despite experimenting with various types of aircraft gun, the Americans never seem to have considered developing a version of the Browning with a calibre larger than 12.7mm. There also seemed to be problems with synchronising the big Browning (its rate of fire dropped by around 30-50%) and it is not clear that electric priming would have resolved them. The best choice would therefore seem to be the speeded-up electric Hispano. Looking at the performance of the WW2 guns, it seems reasonable to expect our 20mm "electric Hispano" to be capable of firing at 750 rpm at the beginning of the war, increasing to 1,000 rpm by making detailed improvements. Our ideal gun could be shorter and lighter as well as faster-firing than the actual Hispano, as the cartridge is shorter and less powerful, so it should weigh around 35-40 kg. Overall, our 20mm gun/ammunition combination would not be radically better than the MG 151, HS 404, ShVAK or Ho-5 (given good quality steels) but would combine the best aspects of all of them. Comparing this performance by using the Gun Power and Efficiency calculations (in the article already referred to) reveals a power factor of 325 (at 750 rpm), rising to 433 (at 1,000 rpm). This compares with 200 for the Hispano Mk.II and 250 for the Mk.V (the best of the wartime 20mm guns). The combination of advantages multiply to make this much more effective overall than any other gun in its class. Efficiency is also high; the weight (37.5 kg assumed) giving calculated figures of 8.7 rising to 11.5. This represents a considerably superior power-to-weight ratio to any actual WW2 gun except for the MK 108 at 9.7. The 30mm cannon should use the same action. In fact, as the cartridges are little different in overall length, the bigger gun would be a similar length but somewhat fatter and heavier. The rate of fire should be 600 rpm initially, with 750 rpm available later, to provide reasonable hit probability. Extrapolation from actual guns indicates that this should have been achievable. There are no close matches with our "ideal" gun - there were very few 30mm cannon - but the closest actual match was the IJA's Browning-type Ho-155, which fired at 450-600 rpm and weighed in at 60 kg. The IJN's Oerlikon-pattern Type 2 weighed 42 kg, although it only fired at 400 rpm. The short-barrelled German MK 108 weighed 60 kg and fired at 600 rpm. On balance, a target of 60-70 kg looks entirely achievable. Overall, we have a reasonably compact and light gun which due to its lighter shells is a bit less destructive against bombers than the MK 108 but is far better against fighters because of its much higher muzzle velocity, and is therefore a better all-round compromise. The calculations of gun power reveal figures of 620 (at 600 rpm) rising to 775. This compares with 580 for the MK 108 and 693 for the MK 103. The efficiency figures are also excellent, as would be expected: at an assumed weight of 65 kg, the scores are 9.5 rising to 11.9. This compares with 9.7 for the MK 108 and 4.9 for the MK 103. How should our matched 20mm and 30mm cannon be mounted on a fighter? Obviously, there is no problem with twin-engined planes, but the usual choices occur with single-engined fighters. The assumption is that an ideal fighter will have a front engine, as all successful WW2 fighters had this. Different gun installation solutions would be possible with liquid-cooled V-12 engines as opposed to radials. To start with vee-engined planes: the mounting options for this category of fighter are: in the wings (outside the propeller disk); in the wing roots (inside the propeller disk, so must be synchronised); in the engine cowling (ditto) and engine-mounted to fire through the propeller hub. The usual RAF/USAAF preference was for outer-wing mountings, which would imply four 20mm or two 30mm and two 20mm. However, the engine-mounted option was such an ideal location for a powerful gun that it seems a shame to waste it. Because it was so good, the gun mounted there should be as powerful as possible, so a 30mm engine cannon should be standard on our fighter. This in combination with a pair of 20mm should give enough firepower for most purposes, so where should the 20mm go? Mounting them in the engine cowling had the advantage of concentrating the guns close to the longitudinal axis, so improving the concentration of fire at all ranges and helping the roll rate. However, it required the complication (and slightly reduced rate of fire - by about 10% for electric priming) of synchronisation, tended to spoil the aerodynamics of the closely-faired cowling, concentrated the weights too far forward and possibly put the guns in competition with the engine cannon for ammunition space. The wing-root mounting avoided most of these problems while still keeping the guns concentrated. The outer-wing mounting avoided the need for synchronisation, but made harmonisation (i.e. adjusting the guns to hit one point) more of a problem, as well as spreading the weight across the wing and possibly harming accuracy through recoil-induced wing-flexing. It may be significant that when the Fw 190 had its armament reduced from the usual four 20mm wing-root and outer-wing guns, it was the outer-wing ones which were deleted. All of this suggests that the wing-root mounting offers the best balance of advantages, given an efficient synchronisation system. This armament of one engine-mounted 30mm and two wing-root 20mm was identical to one of the last and best of the great Fw 190 series, the Ta 152H-1. However, the MK 108 and MG 151 combination in the German plane were poorly matched and of much less use against fighters. If our ideal plane needed more firepower, it would of course be simple enough to add a pair of outer-wing 20mm, and/or to replace the wing-root 20mm with 30mm. The Luftwaffe found problems in synchronising the big MK 103 despite its electric priming, but that had very large cartridge cases which may have caused uneven propellant burning. In radial-engined fighters, the engined-mounted location would of course not be available. However, the engine layout usually meant more room for cowling mounted guns without hurting the aerodynamics (the Soviets mounted up to four cannon in the cowling). Bearing in mind ammunition weight considerations, the best armament combination might therefore have been two cannon in the wing roots with two in the cowling. This would have delivered a 10% lower volume of fire than outer-wing mountings, but the concentration of fire at all ranges would have more than compensated for that.